Caution: You will not be able to click to see large images unless you enable Java on your Browser. In order to make this self contained I am starting with a duplicate of what I wrote earlier although the emphasis will rapidly change to my use of GIT in applet development. GIT is the distributed version control sysytem that Cinnamon uses which was written by Linus Torvalds for the Linux Kernel. GIT Magic - Amore informal but usefull approach - you may need to google for alternative downloads. https://help.github.com/articles/set-up-gi - Github guide. Github.com is the server used for all the cinnamon system software which is free for open source software. My first use of GIT was to be able to build Cinnamon on my own machine and test out various development patches. And I spent quite a lot of time reading the PDF version of the Pro Git book, written by Scott Chacon - the link takes you to an online version and there is a download link for the PDF at the left. I put a copy on the phone so I could dip into it and after a number of passes through the early part the more specific instructions started to make sense - I do not like doing things which I do not understand at all. One should also look at http://www.kernel.org/pub/software/scm/git/docs/user-manual.html for more information. git config --global user.name "pdcurtis"
git config --global user.email "gitmail_at_pcurtis.com"
The first two will need to be done on every machine. I have not yet done the last two as I already seem to be set up in a way that kept me logged in permanently. then move to Muffin Repository and repeat while you are online if you intend to compile muffin. Repeat for muffin if you are going to build it as well. Cinnamon was much smaller than I expected at about 28 Mbytes whilst muffin was 50 Mbytes. Interestingly du gave a much higher figure than the Properties of the folder and these figures rise after compiling to 50 and 70 Mbytes. I suggest allowing 500 Mbytes total as they will grow with the GIT repositories. remote: Counting objects: 16130, done. remote: Compressing objects: 100% (4672/4672), done. Receiving objects: 98% (15808/16130), 9.18 MiB | 622 KiB/Receiving objects: 99% (15969/16130), 9.18 MiB | 622 KiB/Receiving objects: 100% (16130/16130), 9.18 MiB | 622 KiB/Receiving objects: 100% (16130/16130), 9.40 MiB | 655 KiB/s, done. Resolving deltas: 100% (10455/10455), done. This is now getting to the interesting part where we can do a test to see if we can compile from our own local copy, we can then start to make our own changes or pull others test changes before they are accepted into the Master branch and see the effects. The instructions can be found at https://github.com/linuxmint/Cinnamon/wiki/Building and http://community.linuxmint.com/tutorial/view/955 which has some additional comments. I started by only building Cinnamon as I am using the nightly updates so I was unlikely to get seriously out of step. I have built muffin since to check all the proceedures work. and making sure that the deb-source files are present as well as the others. If you are not using Mint you should ignore the first lines. This is for Ubuntu 12.04 precise and Mint Maya maya and precise will change with to nadia and quantal in 12.10 and so on. Note: dpkg may be installed already. The dependencies needs a 30 Mbyte download and occupies an additional 125 Mbytes for Cinnamon and Muffin together. I have only once carried out these stages as I am using the muffin nightly but if you are working from scratch you will need to check the instructions in one of the links above noting you need to use sudo with dpkg -i for all the packages created. It is possible the order matters if you do not have a version of muffin installed already. The version will change but the following should work if you change the version numbers to match. NOTE: You will need a version of muffin before compiling Cinnamon. Installing the nightly from the PPA at the very start seems the most sensible way to make sure you have no unresolved dependencies from doing things in the wrong order even if you then overwrite it by installing custom versions of muffin compiled as above. This is a slow activity but it eventually produces a cinnamon deb file in the parent directory, which you can install with gdebi or dpkg -i. Note: Version number may need to be updated - check in home folder. I then found I had the latest version of Cinnamon - without any changes by me of course. This was real progress. Merging other peoples Pull requests. In this case it turned out to contain 4 commits and had some problems so I wanted to get rid of it. At this point I realised that I should have created a branch for testing it first and it was now in my master branch and very difficult to get shot of. This is because the writers of GIT are almost paranoid about protecting one from ever losing any information which is what I wanted to do. In the end I found http://nakkaya.com/2009/09/24/git-delete-last-commit/ and then http://git-scm.com/2011/07/11/reset.html which is by the writer of GIT Pro which is my current reference book (PDF) and used. HEAD~nn is a shorthand for commit nn before head. Alternatively you can refer to the SHA-1 of the hash you want to reset to. --soft option will delete the commit but it will leave all your changed files "Changes to be committed", as git status would put it. I wanted to get rid of any changes to tracked files in the working tree since before the commits so use --hard instead. This program helps enourmously in helping one see what one is doing. The following is a typical output after my second attempt at merging in a pull request having created a new branch for my testing and a extra branch for a particular test. At this time there have been no additional changes in 'upstream' to fetch and merge. When you change to a different Branch (or location on a branch) the current contents of the working folder (~/Cinnamon or ~/muffin in this case) reflects the changes which have been made and committed at that point (plus changes made but not committed??) . The branch you have changed to “the current branch” is “the branch that will advance when one performs a commit”. The location of the snapshot is refered to as the HEAD?? This creates a new branch from where the HEAD pointed and switches to it. If this is all becoming a bit of a mystery then have a look at http://lostechies.com/joshuaflanagan/2010/09/03/use-gitk-to-understand-git/ which goes through all the steps on how to create a branch to do some work, after it has been test merge it into the branch you are using for long term development (development) , delete the testing branch and how to push the extra work (commits) back to your branch on the remote server (origin) and takes one through what gitk shows after every step in a simple example. Using GIT for applet development. This needed me to create a new repository on the github server called cinnamon-applets and then clone it onto my machine and add my applets into it. I started to do that but got badly out of step when I was fixing the segfault problems so I had to do a retrospective addition of the various stages and commit them in turn. This did not always go well and I needed to do a couple of 'naughty' corrections and I just hope nobody pulled the repositories whilst this was going on! pcurtis@defiant:~/cinnamon-applets$ git commit -a -m "Changes to arrangements for padding to get round removal of leading spaces, reduce jitter and shrink width"
My first Android device was a Generic Android 4.2.2 Network Media Player with Dual Core Processor, HDMI output, 4 USB sockets and a simple remote from 7Dayshop.com . This allows me to plug in a 640 Gbyte USB 3.5 inch drive which has all my music, all my pictures including 'print files' from the last 10 years and most of my old videos transferred from VHS tapes and some 200 Video8 tapes from my camcorders up to 2000 when I went digital. For under £45 this is an exception bit of kit, especially when used with an external mouse and preferably keyboard and plugs straight into a HDMI input on a monitor or TV. It has its own sound output but my HDMI monitor has a headphone output which seems to give less interference and better sound. This was my first experience with Android and it was like going back to the dark ages prior to Windows 95 after using Linux for many years but it does allow me to do most of what I wanted. The simplicity of the Apps available was a real surprise when Android is used extensively on Tablets and even high level phones have far more computing power than my netbook. The biggest problem in this application is however that Android severely restricts the use of external storage by Applications and it is only available write only to applications so, for example, one sets up an application which is capable of lossless rotating of old images which are on their sides but then one finds it can only work on the very limited internal memory so one is faced with using the internal file manager to copy ones folder of pictures to the internal storage (4 Gbytes but only a part is available) viewing and rotating then copying back onto the hard drive. The App I have been using sorts the pictures on file creation time rather than the Exif data and suposedly has the ability to change the accessed dates to match the Exif data (camera shooting time) but can not write them to the hard drive unless one copies them to and from the local memory in the file manager - duh. I found a simple command line program which does it on my Linux machines in a couple of minutes so it is quicker to move the hard drive and do the whole 32 Gbytes than mess around for even a couple of folders. You can run several programs at a time so I can set some music playing then start the Pictures displaying but changing the volume even with the remote stops the slide show. Android obviously handles email in phones and tablets but again it is a trip down memory lane. 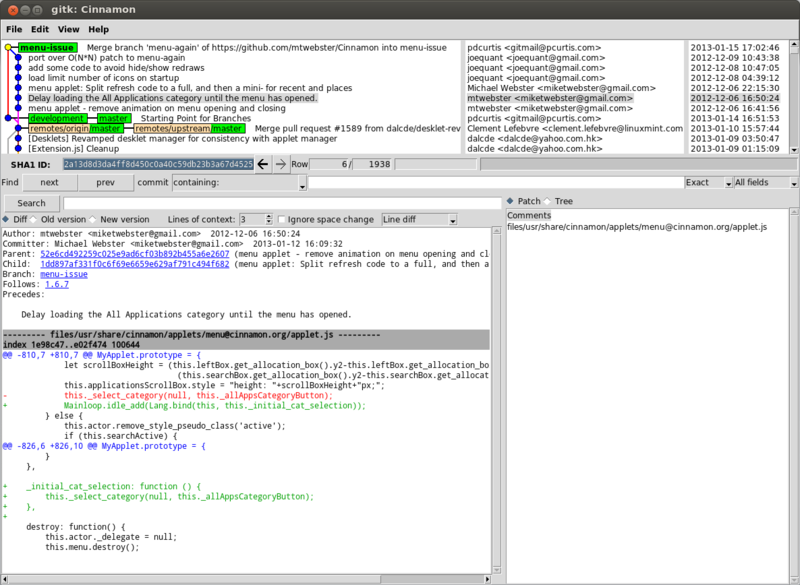 Few email apps in 2012 would even display html mail and it seems only two (which are not free) can write html mail. I suspect most people are driven to web mail. On the good side contacts do get automatically synchronised if you have gmail account which is almost manditory to even download your apps from 'Google Play', the source of 'approved' apps, even the name is a give away to the level of sophistication Google offers in Android. I have set up Inomail on the box which is not bad and handles html mail (even writes it if you pay £3.00) and the integrates and synchronises gmail contacts. The system does not properly synchronise calendars (google not box problem I believe so it may get fixed) so I have to use the web version of google contacts at present on the box but it is looking more like a simplistic but workable set up. I have not got network file sharing working so far. I have installed Samba Filesharing but there there seems to be a fundamental problem as Android seems to block ports below 1000 so SSH and other file sharing requires non standard ports on unrooted machines. JpegTool for lossless rotation of Jpeg files - simple but specialised but not on external media. This proved to be a very different story to the NMP box and almost everything we needed worked out of the box. Partly the basic built- in Android programs have improved in the last year but also a large number have been enhanced by Samsung for their phones and tablets. For example the built in Email, Calendar and Contacts apps are perfectly adequate and work out of the box for POP mail, Gmail, Google Contacts and Google Calendars which all syncronise with Thunderbird and my Blackberry. The Samsung Tab 3 is light (300 gms) and has exceptional battery life, it can be running in the background for days and has a good ten hours of use. There is a built in GPS which is not very sensitive and is slow to obtain lock but even so proved very useful during our time in Holland. The major one is that it only has a single microUSB connection, primarily used for charging, which does not implement OTG. USB On-The-Go, often abbreviated to just OTG, is a specification first used in late 2001, that allows USB devices such as digital audio players, mobile phones and tablets to act as a host, allowing other USB devices like a USB flash drive, digital camera, mouse, or keyboard to be attached to them. Use of USB OTG allows these devices to switch back and forth between the roles of host and client devices. For instance, a tablet may utilise an external USB keyboard or read from removable media when acting as the host device, yet present itself as a USB Mass Storage Device when connected to a computer. In other words, OTG introduces the concept that devices can perform both master and slave roles – whenever two USB devices are connected and one of them is an OTG device, they establish a communications link. Whichever device controls that link is called the master or host, while the other is called the slave or peripheral. 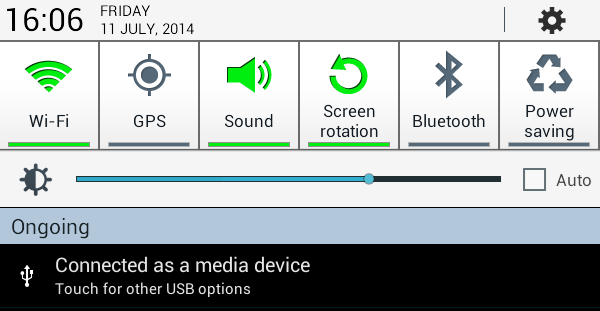 Bluetooth seems to work very easily on the Samsung. I have only tested with the BTR006 audio receiver which paired easily and the music output switches automatically when Bluetooth is on. The Sumvision Cyclone Voyager II Quad Core bought from 7dayshop is a much less refined machine than the Samsung Galaxy Tab 3 7" in many ways but is also much cheaper especially from (£69 v £116), has more flexible interfaces, has a much more powerful processor, but all at the expense of battery life. It is also significantly heavier (355 v 300 gms) and has a smaller display area on the screen as it uses software 'buttons' at the bottom of the screen. The software buttons are however much more flexible and easier to use and as they re-orient with the device rotation and are reprogrammed with context. Keyboard - SwiftKey - A good as or better than the Samsung keyboard and more programmable but misses the 'killer feature' of an integrated multiple clipboard. Power management - Battery Doctor - This makes a large difference but can not compensate for the smaller battery (3000 versus 5000 ma/hr) and power hungry processor. Despite the Sumvision web site stating Bluetooth is only available on Cyclone Voyage II 8" and larger screen pads it is present and works well with the BTR006 audio receiver which paired easily and the music output switches automatically when Bluetooth is on. I have found that Music sometimes stops a few minutes after the screen timeout - changing settings in Battery Doctor seems to solve it although I advise not using the automatic functions to close down background programs can again cuse Bluetooth problems. GPS Essentials - gives information on stallites in view, in use etc as well as lots of other really useful stuff. I checked both the Samsung and the Sumvision had good connections by transfering most of my music collection (10 Gbytes) directly from one to the other. The average speed showed as 3.8 Mbytes/sec and the transfer took ~40 minutes. The battery did not seem to go down much (max 3%) on the Cyclone so it is possible it keeps topped up although it did not show as charging - otherwise it must use very little with the screen off. The Samsung gained 5% charge whilst on the cable as one would expect a slow rate. . I have purchased a 7dayshop RPB52 Universal Portable Backup Power Pack 5000mah and a 7dayshop DC 2.5mm to USB 2.0 High Speed Charging Cable for Bluetooth Receiver / Transmitter & More so I can recharge the Sumvision when away from a mains supply. I also bought a LMS Data Gold Plated HDMI to Mini HDMI Digital / Audio Cable - 1.8m to test the HDMI out put which worked perfectly for Sound and Picture on my LG Monitor. I finally bought and fitted a 32 Gbyte Kingston microSD card. Encryption - Truecrypt and Android implementations. We use the Truecrypt facility to create a Virtual Disk with the contents encrypted into a single file or onto a disk partition or removable media such as a USB stick. The encryption is all on the fly so you have a file, you mount it as a disk and from then on it is used just like a real disk and everything is decrypted and re-encrypted invisibly in real time. The virtual Drive is unmounted automatically at close down and one should have closed all the open documents using the Virtual Drive by that point just like when you shut down normally. The advantage is that you never have the files copied onto a real disk so there are no shadows or temporary files left behind and one does not have to do a secure delete. I have had it loaded it onto all my Windows and Linux systems. Truecrypt obviously installs deep into the operating system in order to encrypt decrypt invisibly on the fly. Making new volumes (encrypted containers) is now trivial – just use the wizard. One has to have administrative privileges to mount ones volumes and under Linux this means that one is asked for ones administrative password on occasions as well as the volume password when the Truecrypt volume is mounted. Truecrypt has now been withdrawn under rather odd circumstances by its original writers and its future is ill determined allthough the formats will no doubt continue to be supported and developed. At present the work and downloads of existing versions is concentrated at truecrypt.ch. There are a couple of options to open TrueCrypt containers on the go using an Android device. Cryptonite is in some ways the more elegant solution but unfortunately it requires the device to be rooted in order to handle TrueCrypt files. For those who don’t want root their devices, there is EDS (Encrypted Data Store). EDS can create Truecrypt vaults (containers), display the 'linked' containers, open them and display the contents in a File explorer which can also display normal files and launch applications. In practice the process of viewing and editing encrypted files from a Truecrypt Vault is quite practical and is done within EDS Lite. The interface is however not completely intuitive or consistent with other apps, but few are! Dropbox works somewhat differently on a mobile device to on a computer. On computers one has a folder (Called Dropbox in your home folder under Linux) which is syncronised to the Dropbox in the Cloud and then syncronised with similar folders on PCs running Linux, Windows or on Apple computers. As soon as a file has been changed it is uploaded and other machines have it available and are downloading almost immediately. This would provide an unacceptably large data flow for mobile devices so only the file names are available on mobile devices and they are downloaded for use on demand when an appropriate application is available. They can also be stored locally if they are marked as favourites for offline use. The only major exception is with ones pictures which can beuploaded automatically with an option to hold upload until a Wifi connection is available. This means that it is difficult to keep even small files continuously and automatically in syncronisation as is desirable for a Truecrypt Container. First make sure that the 'Vaults' aka Truecrypt Containers are up to date by running Dropsync if there is any chance that any have been modified since the last syncronisation - Dropsync should start with a screen which has the usual syncronisation symbol in the top bar. You do not need to close it afterwards. What was needed was an enhancement of the functions of the Blackberry onto a screen capable of handling simple web browsing and basic office functions yet light to carry and cabable of lasting for long periods between charging. The netbooks/laptop also handles our music played through bluetooth, web authoring and as an image organizer and viewer and editor for digital photos from our cameras. A sensible target would be to extend the time away from a day with a phone to a long weekend (or even a week) with a pad with a saving of several kgs. This proved to be very easy and provides access to the internet via an Android smart phone - in my case a Samsung S3 Mini (GT-I8200N) with Android 4.2.2 although this should work with most phones and equal or higher versions of android. The phone needs an active internet connection which can be a mobile phone connection with Data enabled or a Wifi connection. One might ask why bother in the case of a wifi connection, why not connect directly? It has obvious advantages if you are on a 'pay by time' connection as you can connect several machines as well as the phone and it also gives extra security in an internet cafe. 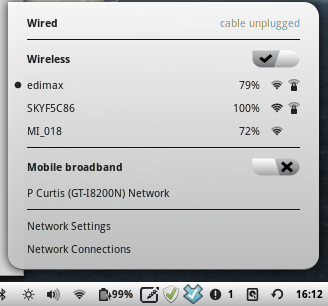 In may cases the phone can be set up to log in automatically to a Sky or similar Wifi connection. On Computer: You are now paired and should still have a screen which has a box marked 'Use your phone as a network device (PAN/NAP) which should be ticked, if not tick it. There is no quick links in the notification panel on the Android phone for switching tethering on and off but you can add a Settings widget to the home screen to take you straight to the tethering settings. 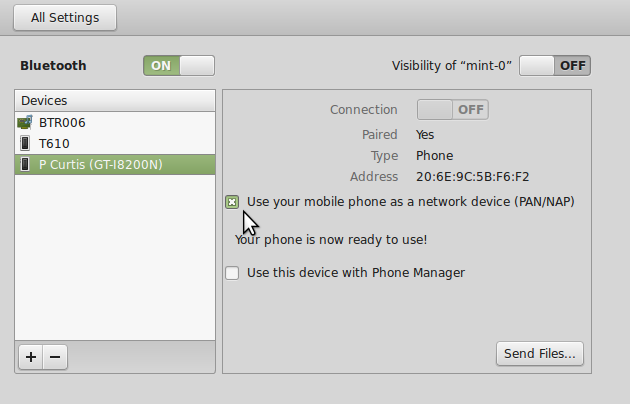 The Bluetooth manager detects that the Android device supports PAN/NAP and, by ticking the box, creates a connection for the Network Manager. The Network Manager (in the form of the applet) makes this available but the support is incomplete. As mentioned above one easily ends up with duplicate connection which have to be deleted from the terminal as root. The connection is also identified by the Bluetooth address and it delivers this rather than the actual connection interface which is bnep0 and is displayed as a Mobile Broadband Connection which is an approximation to the truth! This causes a problem with my NUMA applet which depends on the interface delivered by the Network Manager so I have had to add an exception as I have with the ppp0 interfaces used by Mobile Broadband connection. 4. Each entry will come up in turn and give an opportunity to clear all the address book data with a YES. You can use "RSET" with both calendar and contacts. Its the same process for both, so I'll use the calendar application as an example. Pull up your CALENDAR application, go to OPTIONS, and type "RSET", just like that, out of no where, a dialogue box will appear asking you if you want to wipe-out the calendar (don't worry about erasing all calendars, a separate dialogue box will appear for each calendar item in your berry). If you only want to wipe out a particular calendar, simply hit "NO" to the calendar(s) you want to keep as is and hit "YES" to the one(s) you want wiped. Same exact process for contacts applies. For both, if you do decide to wipe out a CALENDAR and/or CONTACTS profile, and it is linked to an OTA-sync account, as soon as the wipe-out is complete, the berry will try to OTA sync again. TV viewing and recording solutions for Linux is a blog with a lot of useful suggestions, although written for the STK1160 device based EasyCAP much is applicable to capturing from all the devices - especially the page on the mtvcgui program. The USBTV007 version is arguably the least desirable as the drivers currently available do not support sound capture although all that means in practice is that one needs an extra cable from the video source to the sound input on the computer. You also need a very up to date Kernel to get out the latest usbtv module to provide of the box support - the 3.13.0-24 kernel in Ubuntu 14.04 Trusty and Mint 17 Quiana is fine and supports PAL video unlike earlier versions but not audio. There is also a module under development which you can build which adds audio which I have not tried. You must manually set the video device name, audio device name and video standard (PAL) each time although they should be available on the drop downs. Capture is via the drop down beside the play button and is called convert. There are lots of preset profiles and you can create new ones very easily and save them. I created one with a MP4 container with H.264 video and AAC 48 kbyte audio which is the closest to a MP4 standard. You do not have to set a video data rate and it seems to adapt to limit the size to fit on a DVD or uses 6000 kb/s (~ 3 Gbytes an hour). The quality looked fine on a 3 hour VHS conversion which used 3000 kb/s (~1.5 Gbytes/Hour). If you use AAC it makes use of an experimental FFMpeg codec (libfaac) and you have to set an obscure setting or you will get an error message. One must force strictness to -2 in FFMpeg options in the advanced VLC options. It's under Tools>Preferences, then click All under Show settings, click on Video codecs under Input / Codecs, then click FFmpeg . Under FFmpeg scroll down to under Encoding and I go to Strict Standard Compliance and set it to -2. See http://ffmpeg.org/ffmpeg-codecs.html#libfaac for some more information on why and what this does. Once done it 'sticks'. I usually capture video from the MiniDV Video Recorders using Kino as DV AV Type 2 with Auto Split Files and Add Time Stamp set. The video files in all the DV formats are huge (12 Gbytes/Hour) so I have been looking at converting to use a MP4 container with an efficient H.264 video stream and AAC audio which reduces it down to circa 2.5 Gbytes/Hour. This can be done directly by FFMpeg but it is difficult to get optimum parameters, some of which may need to be optimised for the form of video, especially if one wants to deinterlace at the same time. It is capable of converting a folder full of DV captures at one time - Kino is set up to put each recording into a separate file with a timestamp in my default set up so this is essential as an hour tape often contains over 200 scenes. Unfortunately the latest versions of Handbrake in the Ubuntu repositories do not handle MP4 because Ubuntu do not want to distribute software with MP4 support because it is patent-encumbered. Installing the "restricted-extras" package solves the problem for many proprietary formats, but this alone is not sufficient for Handbrake and furthermore HandBrake does not support external encoders so it is not possible to add an encoder to HandBrake at runtime. All the encoder libraries are built in and not dynamically linked/loaded at runtime and Ubuntu has unhelpfully recompiled its version of Handbrake for the repositories without the MP4 support. The last time Handbrake was available from a PPA rather than the Ubuntu Repositories was for Ubuntu 13.04 raring but the appropriate stebbins handbrake-releases PPA (from the author) has been updated to a reasonably recent version of Handbrake. So how do we fudge things to install from a PPA for an older version of Handbrake? Fudges to install a Linux version of Handbrake which will convert to MP4. First uninstall the versions of handbrake from the repositories if you have installed it. Then follow the instructions at https://launchpad.net/~stebbins/+archive/ubuntu/handbrake-releases to install the handbrake-releases packages. Note that the last version in the PPA is for raring but it is version 0.99 which is the current stable version. Now we need to fool the system that it is for trusty! and you will have a version of Handbrake with MP4 support. Converting a folder with Handbrake. The commands are not immediately obvious and one uses Source to select a Folder then Queue -> Add All Queue then Queue to check and start. Deinterlacing is required to remove the comb artifacts from interlaced video when there is any motion in the scene. Deinterlacing however reduces the quality so it's not good to run a deinterlacer all the time and it can really slow down an encode. Often content is mixed, cutting back and forth between interlaced and progressive video. Even in interlaced content, filtering is only necessary when either something in the scene or the camera moves, producing those combing artifacts. Handbrake has a clever alternative called decomb. The decomb filter looks at each pixel of each frame of a video. It then only deinterlaces frames that show visible amounts of combing. This means you never have to check if a video you're encoding is interlaced -- just run the decomb filter all the time and it'll take care of everything. The Deinterlacing is set up from Picture Settings -> Filters and Decomb and Default should be used unless you know that the video was recorded entirely with progressive video. The setting however does not seem to be sticky so you need to remember to set it. I have been using the Normal preset but have tried increasing the x264 preset to Medium which increases the encoding time considerably. Changing from a .m4v to .mp4 extension. By default Handbrake adds a .m4v extension to MP4 containers. That is the only difference and it is perfectly acceptable to just change the extension of the files. The following command line string will change all files in the folder where it is run and starting with DV with a .m4v extension to .mp4. The DV start matches my MiniDV capture files and acts as a protection in case one calls it from the wrong folder! Concatenating all the video clips in a folder. FFMpeg has a utility to concatenate video files fast and losslessly but Ubuntu has switched to a brach from FFMpeg called AVconv which does not include this. Note that I have used an intermediate file rather than piping as I found it gave problems and also it is useful to have the file list. Also note that the output file has a different extension for the same container to avoid duplicating if the command is run a second time. The following is a log of what I did to try and backfill in GIT after I had made one or two significant changes to my three applets and wanted to be able to track them properly. It had been many months since I had used GIT so I wanted to avoid damaging what I already had whilst it came back to me. So I cloned the existing repository onto another machine so I could 'practice' until I was happy to push it back to the server. I then progressively copied the changed files from the first update across and did a commit, then the next set of updates and commited and so on. I had a few mistakes and the log shows the brute force way I used to backtrack to start again from before the mistake. The most common mistake is to have the wrong message with a commit and I found the git commit --amend did not actually make any changes hence the forced reset. See below for why --amend did not work. In the end it all worked out well so I pushed to the server from the second machine and then cloned back to my normal machine after backing up the original. One should have been able to just fetch but I wanted an easy life! I then added a few tags to the Uploaded versions which were available to users. It starts with installing git and the git viewer gitk which helps enormously to visualise where one has got to. I have added a few comments on what each step was. Receiving objects: 100% (190/190), 81.08 KiB | 0 bytes/s, done. Resolving deltas: 100% (105/105), done. curtis@matrix:~/cinnamon-applets$ git commit -a -m "Stopwatch v20_0.9.8 Check we have a valid temperature returned from nvidia-settings"
pcurtis@matrix:~/cinnamon-applets$ git commit -a -m "Bumblebee 0.9.8 Check valid temperature returned from nvidia-settings - UPLOADED 11 November 2014"
pcurtis@matrix:~/cinnamon-applets$ git commit -a -m "NUMA - 2.5.0 Multiple Instance capability but set to 1"
pcurtis@matrix:~/cinnamon-applets$ git commit -a -m "NUMA 2.6.0 Android Bluetooth via bnep0 added. FormatSentReceived improved UPLOAD CANDIDATE"
Writing objects: 100% (17/17), 17.84 KiB | 0 bytes/s, done. // What tags have we got already? // Backfill done - now we can carry on in proper manner! Putting all my standard git configuration actions together when working on a fresh machine. If we add together all the various configuration which I have applied to git, the follow is required if I set up on another machine including obtaining the local copy. We now have the ability to develop the applets but for test they need to be within ~/.local/share/cinnamon/applets.